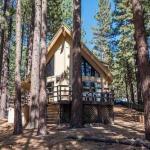 Knoll Lane Holiday home offers accommodation in South Lake Tahoe a 13-minute walk from Heavenly Ski Resort and 1.4 km from Tahoe Queen. Guests staying at this holiday home have access to a patio. This holiday home is equipped with 3 bedrooms a flat-screen TV and a kitchen. South Tahoe Ice Arena is 2.1 km from Knoll Lane South Lake Tahoe while Washoe Meadows State Park is 9 km away. Reno-Tahoe International Airport is 65 km from the property.